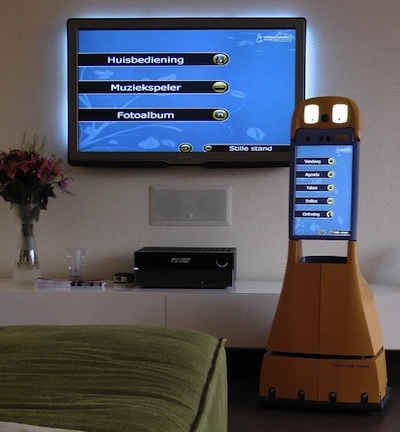 Hector is a companion robot created by a European Union consortium called the CompanionAble Project. Hector is the latest result in this fascinating project, which seeks to meet the anticipated needs of an aging population. The distinguishing advantages of the CompanionAble Framework Architecture arise from the objective of graceful, scalable and cost-effective integration. Thus CompanionAble addresses the issues of social inclusion and homecare of persons suffering from chronic cognitive disabilities prevalent among the increasing European older population. CompanionAble Co-ordinator Professor Badii demonstrated some of Hector's capabilities as an assistive companion robot. Some of the care support facilities including diary management [and] aide memoire services..
From Companionable Project via Forbes.